How much would you consider spending on a luxury item that you really, really coveted? How about a lavish designer purse, like a Louis Vuitton or a Chanel? We’ve all seen the gossip magazines – the ones that feature celebrities carrying expensive, outrageously priced handbags. How can one purse be worth $5, 000, or even $10, 000, or more? After all, it’s not encrusted with diamonds or gold. Really, when you break down the item, it’s just leather and hardware. You may not believe me, but I meet a lot of everyday, average people who spend big money on luxury items. Most people have a ‘thing’ – an item or hobby that they actively shell out a lot of money on. We all have our passions, interests, and goals, and of course, these aren’t going to align with what other people want from their lives. For many of us, $5, 000 is more than a joint monthly income. So how can an ‘average’ individual justify spending that much on a non-essential item? Perhaps a more important question is why are people willing to spend that much on something that they don’t absolutely need to survive? I think the answer is multifaceted. One point of view that comes up a lot in this discussion is that when you buy an expensive luxury item, you are often just paying for the brand name. Designer labels such as Chanel, Prada, Hermès, Fendi, Versace, and Gucci, among many others, have evolved into a status symbol. By owning an item created by these designers, you may be telling yourself and the world that you are wealthy, or, that you associate with the wealthy. Inherently, we seem to believe that by associating with the wealthy, we are more successful, happier, and have better lives than those who don’t. Everyone says that money doesn’t buy happiness, but does it buy status, prestige, and success? In our consumer driven culture, it is easy to believe that it does. Another argument that I often hear in defense of purchasing high end retail items is that “You get what you pay for.” I, myself, am a proponent of this belief; however, it is relative. When most people buy something as disposable as a handbag, they really aren’t looking for it to last their entire lives. People buy different accessories to go with new outfits, and to be honest, most people grow tired of a once coveted item after using it every day for a year or two. So, although the lifespan of a material good such as a handbag should be taken into consideration, if it’s the main point of your argument (“I spent $5000 on this purse, but it will last me 25 years!”), then I would reconsider your thought process. No one is going to want to use the same handbag every day for 2 years, much less 25 years. A recent news story would be enough for me to reconsider carrying around such a lavish item – this poor woman had her $5000 Chanel purse snatched in a mall. There’s no way to tell if she was the victim of that crime because of the price tag of her handbag, or if it was merely a coincidence. Worrying about losing a pricey item in such a surprising way is enough to deter me from purchasing. Finally, there appears to be a disconnect between those with the purchasing power to fund such extravagant purchases, and those who can’t. You may see a person carrying an expensive purse down the street and think to yourself, “Wow, I wonder how she could afford such an item?” But the truth of the matter is you really don’t know if she can afford it. The purchase could have been made on credit, or, it could have been a gift from a wealthy relative. She also could have saved for years to buy such an expensive item. Judgement about others often leads to dissatisfaction in our own lives, as we are trying to live up to an imaginary ideal life that we believe other people are living. While one person may think that a $10, 000 handbag is an investment, another person may see it as a total waste of money. Thought processes are relative to many ideas that we construct about our lives: who we are, what we want, what we’re willing to do to get it. As long as we understand that our perceptions of ourselves and our desires are in direction relation to media and marketing, then we stand a chance of taking control of our emotions and changing our paths if we want to. In our current society, we are a part of a system that has convinced us that we need something that perhaps we don’t. Many of my clients cannot recall what they bought with their credit card a year ago – imagine how that feels after five years of paying off the debt? Re-thinking and questioning why we want something – what we are really trying to buy with our purchase – is one key to staying on a strong financial path. What do you think? 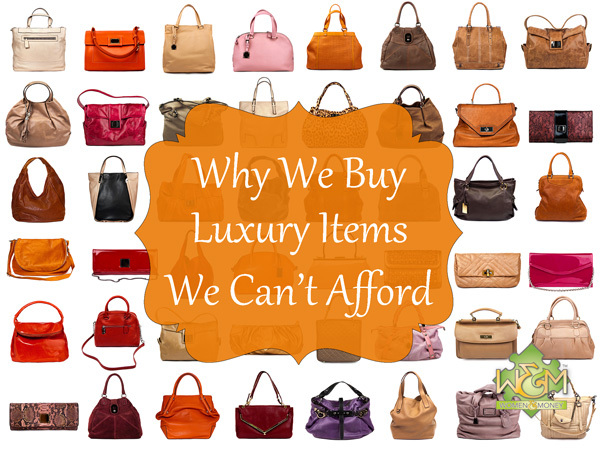 Would you consider purchasing a luxury item that is out of your regular price point? How would you fund such a purchase? This entry was posted in Blog, Personal Finance, Women and Money. Bookmark the permalink. Both comments and trackbacks are currently closed.